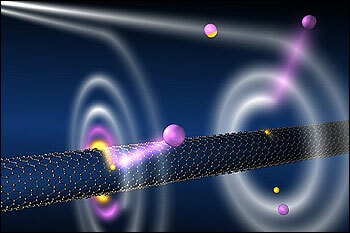 CAMBRIDGE, Mass., April 7, 2010 — Carbon nanotubes, long touted for applications in materials and electronics, may also be the stuff of atomic-scale black holes. "On a scale of nanometers, we create an inexorable and destructive pull similar to what black holes exert on matter at cosmic scales," said Lene Vestergaard Hau, Mallinckrodt Professor of Physics and of Applied Physics at Harvard. "As importantly for scientists, this is the first merging of cold-atom and nanoscale science, and it opens the door to a new generation of cold atom experiments and nanoscale devices." Hau and co-authors Anne Goodsell, Trygve Ristroph, and Jene A. Golovchenko laser-cooled clouds of one million rubidium atoms to just a fraction of a degree above absolute zero. The physicists then launched this millimeter-long atomic cloud towards a suspended carbon nanotube, located some two centimeters away and charged to hundreds of volts. The vast majority of the atoms passed right by the wire, but those that came within a micron of it – roughly 10 atoms in every million-atom cloud – were inescapably attracted, reaching high speeds as they spiraled toward the nanotube. "From a start at about 5 meters per second, the cold atoms reach speeds of roughly 1200 meters per second, or more than 2700 miles per hour, as they circle the nanotube," said Goodsell, a graduate student on the project and now a postdoctoral researcher in physics at Harvard. "As part of this tremendous acceleration, the temperature corresponding to the atoms' kinetic energy increases from 0.1 degrees Kelvin to thousands of degrees Kelvin in less than a microsecond." At this point, the speeding atoms separate into an electron and an ion rotating in parallel around the nanowire, completing each orbit in just a few trillionths of a second. The electron eventually gets sucked into the nanotube via quantum tunneling, causing its companion ion to shoot away – repelled by the strong charge of the 300-volt nanotube – at a speed of roughly 26 kilometers per second, or 59,000 miles per hour. The entire experiment was conducted with great precision, allowing the scientists unprecedented access to both cold-atom and nanoscale processes. "Cold-atom and nanoscale science have each provided exciting new systems for study and applications," said Golovchenko, Rumford Professor of Physics and Gordon McKay Professor of Applied Physics at Harvard. "This is the first experimental realization of a combined cold atom-nanostructure system. Our system demonstrates sensitive probing of atom, electron, and ion dynamics at the nanoscale." The single-walled carbon nanotube used in these researchers' successful experiment was dubbed "Lucy." The nanotube was grown by chemical vapor deposition across a 10-micron gap in a silicon chip that provides the nanowire with both mechanical support and electrical contact. "From the atom's point of view, the nanotube is infinitely long and thin, creating a singular effect on the atom," Hau said. This work appears in the current issue of the journal Physical Review Letters and was supported by the Air Force Office of Scientific Research and the National Science Foundation. Cold nuclear synthesis is possible? What is the significance of this find out? To me it just re-demonstrated that a strong positive voltage can attract an electron even the electron is combined to an ion. Maybe I am too shallow in physics.